SW Aviator Magazine is available in print free at FBOs and aviation-related businesses throughout the Southwest or by subscription. The web's most comprehensive database of Southwest area aviation events. A continuosly changing collection of links to our favorite aviation related web sites. Four centuries of history cant be wrong. Abundant natural beauty, a year-round mild climate, and the subtle blending of the many cultures that comprise its history make Albuquerque, New Mexico an exciting destination well worth exploring. Beautifully situated at the base of the rugged Sandia Mountains, in a wide green valley straddling the legendary Rio Grande, Albuquerque has been influenced by Native Americans, Spanish explorers and settlers, and - most recently - American immigrants, who have all called this land home. Though its roots can be traced much earlier, the city of Albuquerque was officially founded in 1706 by Spanish settlers. The city was named in honor of a Spanish Duke, the 10th duke of Alburquerque, a common custom of the day (and transparent ploy to garner favor with the Spanish royalty). Mercifully, the first r has been dropped from the citys name over the years, though it remains a nightmare for aspiring spelling bee champions everywhere. 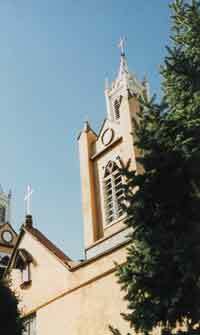 One of Albuquerques most popular tourist attractions preserves the old Spanish settlement. Historic Old Town is now a collection of shops and restaurants. The original Spanish layout is still very much in evidence, with narrow, shop-lined roads and passageways radiating out from a grassy central plaza. The 290-year-old San Felipe de Neri Church, dominating the north side of the plaza, was the first building erected in Albuquerque, and though enlarged over the years, still contains the original thick adobe walls of the first modest chapel. Retail entertainment abounds in Old Town. With 150 stores and fine restaurants, and at least 24 art galleries, visitors are sure to find something special. Shops ranging between elegant and tacky display everything southwestern, from expensive Indian art to howling coyote tee shirts. Local artisans sell their wares from blankets spread on the sidewalk near the plaza. Some of the best finds on handmade Indian treasures can be found just west of Old Town, on Lomas Ave. The Palms Trading Company is a local legend for wholesale-priced Indian jewelry and Pueblo pottery (505-247-8504). Directly across the street is the unmistakable storefront of Gertrude Zachary jewelry, featuring some of the most progressive Indian jewelry in the industry (505-247-4442). While in Old Town, dont miss the American International Rattlesnake Museum, located just off the plaza. This museum houses the worlds largest collection of rattlesnakes on public display, and is dedicated to their conservation and preservation, not exploitation (505-242-6569, rattlesnake.com). Adjacent to Old Town are two fine museums, the Albuquerque Museum and the New Mexico Museum of Natural History and Science. The Natural History museum features extensive interactive displays of the regions prehistoric past, including a walk-through volcano and extensive dinosaur exhibits showcasing discoveries of the areas rich fossil beds. There is also a planetarium and space science center, along with a Dynamax theater (505-841-2800). At the Albuquerque Museum, you can view interesting artifacts from citys rich history, including an excellent display of Spanish conquistador armor (505-243-7255). The arrival of the Atchison, Topeka, and Santa Fe railroad in 1880 brought explosive growth to Albuquerque, and shifted the center of town two miles to the east, closer to the railroad station. It is interesting to note that unlike other western boomtowns in this era, Albuquerque never went through the lawless frontier days. When those times came, Albuquerque already had an established culture a century-and-a-half old. The area near the railroad tracks quickly became known as New Town, and is still vibrant today as the citys Downtown. Nightclubs, restaurants, and a new multiplex theater line Central Avenue (formerly the legendary Route 66), and the old Santa Fe Railroad roundhouse is being converted into a first-rate transportation Museum. Downtown Albuquerque is also home to one of the first Hilton hotels. La Posada de Albuquerque was built in 1939 by New Mexico native Conrad Hilton, and is on the National Register of Historic Places. La Posada still retains much of its original flavor, with hand painted murals and a tiled fountain gracing the two-story lobby, topped by a carved beam ceiling. (800-777-5732, laposada-abq.com) The hotel is also home to the Jane Butel School of Southwestern Cooking, recognized by Bon Appetite Magazine as one of the best vacation cooking schools in the world. Great food abounds in Albuquerque, with New Mexican cuisine reigning supreme. A hallmark of New Mexican food is the red or green chile sauce that smothers most entrees, prompting the official state question Red or green? from your sever when ordering. Be warned, New Mexico chile can be blazing hot, so order the sauce on the side if youre not accustomed to spicy food. Mercifully, another hallmark of New Mexican dining are the soft, doughy sopaipillas and honey served with every meal, which make an effective fire extinguisher. For traditional fare in a fun atmosphere, try one of the family-owned Garduños restaurants (505-298-5514, gardunosrestaurants.com). Perennial favorites include green chile chicken enchiladas, carne adovada (pork marinated in red chile), and the chile relleno (a whole cheese-stuffed green chile breaded and deep-fried - watch out for the stem). Another popular restaurant with tourists is High Finance. Perched nearly a mile above Albuquerque on the 10,378-foot precipice of Sandia Peak, High Finance has fabulous views of Albuquerque and the Rio Grande valley. Serving lunch and dinner, the restaurant is only accessible via the 2.7 mile long Sandia Peak Tramway, the worlds longest jigback passenger tramway (505-856-7325, sandiapeak.com). This Swiss-built tram whisks visitors from the high desert cactus of the foothills to the alpine environs of Sandia Crest in just over 12 minutes. Dinner reservations at High Finance are a must, and will get you discounted tram tickets (505-243-9742). 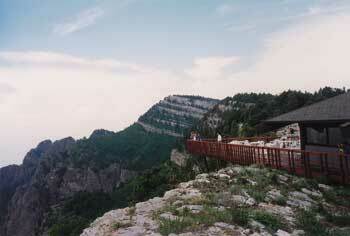 The tram also services the Sandia Ski Area, featuring 30 trails and four chair lifts. Once at the trams summit, linger at the Four Seasons Visitor Center, with interesting exhibits of the areas geology, climate, and wildlife, before stepping outside to marvel at the 11,000 square mile vista that surrounds you. After the snow melts, the hiking and nature trails open for visitors to enjoy the cool green pines and delicate alpine wildflowers - a sharp contrast to the prickly cactus and scruffy juniper far below. Another surprising contrast to Albuquerques desert surroundings is its top-notch aquarium. The Albuquerque Aquarium is a real showplace, where visitors can follow a drop of water down the Rio Grande from high in the San Juan Mountains of Colorado to the Gulf of Mexico. Highlights include a walk-through eel cave that will get you up close and personal with dozens of moray eels (guaranteed to make your skin crawl), and a huge 285,000-gallon shark tank with floor to ceiling viewing windows. These windows extend into the adjacent Shark Reef café, a fun place for a meal before of after touring the aquarium. The café offers traditional lunch and breakfast fare, including tasty green chile cheeseburgers and generous breakfast burritos. They also serve fish, but it might be a bit uncomfortable feasting on seafood under the disapproving stare of the distant relatives swimming above. Adjacent to the aquarium is the Rio Grande Botanic Garden, 16 acres of beauty embracing a 10,000 square foot conservatory. The conservatory is divided into two houses: the Desert Pavilion that displays plants from the Chihuahuan and Sonoran deserts, and a Mediterranean Pavilion. There is also a butterfly house, open in the summer months. Call 505-764-6200 for more information on the Aquarium and Botanic Garden. Just north of the Botanic Garden, and nearby Old Town, is another wild oasis in the heart of Albuquerque - the Rio Grande Nature Center. Located on 270 acres of riverside forest and meadows, the center is ideal for a delightful walk to the Rio Grande through the bosque (as these wooded areas are called in the Southwest). The bosque is home to 100-year old stands of cottonwoods, along with clumps of willow and tamarisk. Look for evidence of beavers along the riverbank, and keep an eye out for some of the 260 species of birds that make this their temporary or permanent home. The Nature Centers visitor center overlooks a cattail marsh alongside a three-acre pond. 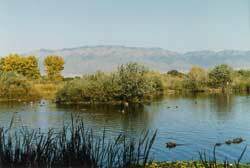 Spend some time in the peaceful, indoor wildlife viewing area watching the ducks and geese splashing in the pond, set against the dramatic backdrop of the Sandia Mountains. The visitor center also has interpretive displays of the bosque, as well as a nice little gift shop (505-344-7240). The Rio Grande teems with migratory waterfowl in the winter months, and is a destination for bird watchers from around the globe. Watch for flocks of Sandhill cranes and Canadian geese over the river, particularly near sunset. These flocks are often so large they light up on radar at ABQ, and pilots have encountered huge flocks thousands of feet above the ground. For a change of pace, consider visiting one of Albuquerques fine wineries. Many people are surprised to learn that New Mexicos Rio Grande Valley is Americas oldest wine grape growing region, dating back to 1629. The sandy soil, clear warm days, and cool night create near perfect growing conditions. An entire afternoon can be spent wine tasting without ever leaving town. Anderson Valley Vineyards is a few miles north of Old Town, on Rio Grande Blvd. (505-344-7266). (Incidentally, the vineyards founder Maxie Anderson helped pilot the first balloon to cross the Atlantic, the Double Eagle II, in 1978) A bit further north is Casa Rondena, a charming, gracious winery in the heart of Albuquerques North Valley (505-344-5911, casarondena.com). Another unexpected surprise is that, according to wine critics, Albuquerque is home to the best sparkling-wine producer in the nation. The Gruet family, originally from the Champagne region of France, have been creating award-winning wines here at their Gruet Winery since they moved to New Mexico in 1984 (505-821-0055). Close to Gruet is the Jory Winery. Jory has been producing gold-medal winning wines in New Mexico since 1994, and was voted Best New Mexico Winery in 1999 (505-858-0074, jorywinery.com). For a complete list of New Mexico wineries visit www.nmwine.net. More fine wine, along with exceptional scenery, can be found a short drive northwest of Albuquerque, at the Ponderosa winery nestled in the beautiful Jemez Mountains. Ponderosa produces award-winning estate bottled Riesling and Pinot Noir wines (505-881-7778). Even if you are not into wine, this is a worthwhile day trip just to enjoy the beautiful red-rock canyons, visit the Jemez (HAY-mez) Pueblo, and tour the ruins of the 17th-century Spanish Mission of San Jose de los Jemez in the nearby town of Jemez Springs. Another great day trip from Albuquerque is a drive to Acoma (AH-koh-mah) Pueblo, located about 45 minutes west of town. Considered one of the states most dramatic landmarks, Acoma sits atop a 376-foot-tall mesa. The pueblo is considered by many to be the oldest continuously inhabited settlement in America, dating back over 900 years, making Acomas well preserved 17th-century Spanish mission church seem like a newcomer. The pueblo offers guided tours hourly, though it is recommended to call ahead (505-552-6604). In addition to seeing the pueblo, this is an excellent opportunity to buy exquisitely detailed hand painted Acoma pottery direct from the artist. The Pueblo influence still shapes Albuquerque, most recently evidenced by the numerous casinos springing up on the tribal land around town. Another innovation is the joint venture between the Santa Ana pueblo and the Hyatt hotel chain. Their new $80 million Hyatt Regency Tamaya Resort & Spa is a real showplace. This beautiful 350-room hotel sits on 500 acres just north of Albuquerque, with stunning views of the Rio Grande and Sandia Peak. The spa, fine restaurants, three swimming pools, and a new 18-hole golf course ensure guests a memorable stay (505-867-1234). The best place to learn about New Mexicos various Pueblo tribes is to visit the Indian Pueblo Cultural Center. Located in the heart of Albuquerque, the Center houses an excellent museum on the history, mythology, and culture of the pueblo people, as well as displays showcasing each of the 19 sovereign Pueblos scattered across north central New Mexico. The Center also features live demonstrations by artists and dancers, and houses an extensive gift shop selling Native American crafts (505-843-7270). The many centuries of American Indian, Spanish, and Anglo influences have each left their mark on Albuquerque. This tri-culture blending of food, religion, art, customs, architecture, and traditions makes Albuquerque a unique, vibrant city. Throw in a healthy dose of natural beauty, and a generous portion of sunny flying weather, and you have all the ingredients for the ideal vacation. 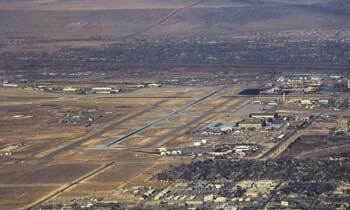 Albuquerque has two fine airports (regrettably, the third, Coronado, was recently closed). The uncontrolled Double Eagle II airport (AEG) is a on the far west side of the city, and has nice facilities and reasonable fuel prices. FBOs are Aerowest/Bode Aviation (505-352-0292) and West Mesa Aviation (505-831-2359). A nice cafe is located in the upper floor of the West Mesa building. Aerowest will arrange a rental car for you, given at least 24 hours notice. The Albuquerque International Sunport (ABQ) is much more convenient to atown, and has direct access to all major rental car companies. Fuel prices are noticeably higher though. The Sunport also offers a better selection of into-the-wind runways - a particularly important consideration during the spring windy season. 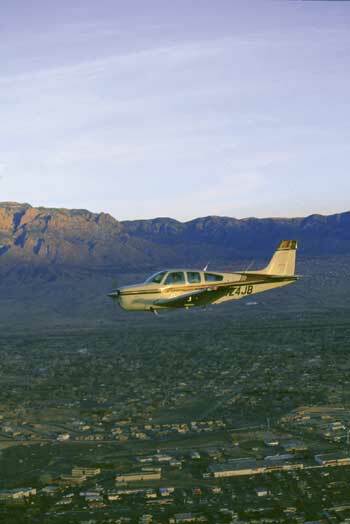 Albuquerques airspace is Class C, so contact approach control about 20 miles out. The controllers at ABQ are very good at sequencing general aviation aircraft in with the airliners, and patient and professional with pilots unfamiliar with the area. If things do get busy, consider requesting the GA runway, 12/30, or the seldom-used 17/35 to avoid delays and wake turbulence. Once on the ground at ABQ, you will be faced with a difficult choice between the two excellent full service FBOs. Cutter is conveniently located to runway 08/26, pumps Phillips 66 and is the local Beechcraft dealer (505-842-4184). Seven Bar Aviation is closest to runway 03/21, and features Exxon fuel (505-842-4990). Both FBOs offer courtesy van transportation, and have on-site car rentals available through Hertz. Flying weather in New Mexico is generally good year-round. Spring afternoons tend to be very windy, though the winds quickly die down after sunset. Late spring through early summer offers excellent flying weather. Afternoon thunderstorm season fires up in early July and lasts through mid-September, so during those months most pilots plan to finish flying by midday to avoid the buildups and convective turbulence. Fall in New Mexico provides outstanding flying weather, with cool, clear, calm air, and plenty of daylight to enjoy the spectacular fall colors. Winter weather is typified by snowy cold fronts rolling through once or twice a week, punctuated by several clear, sunny days between systems. Since the area around Albuquerque is quite mountainous, be mindful of the winds aloft forecast. Strong winds will produce equally strong turbulence on the lee side of the mountain ridges, so plan a route to avoid this unpleasantness if possible. Also be confident of your aircrafts ability to perform well in this high density altitude environment (field elevation at ABQ is 5352). Most local pilots purposely keep their airplanes light on fuel during the summer months to maintain an adequate performance safety margin. Click here to return to the beginning of this article.